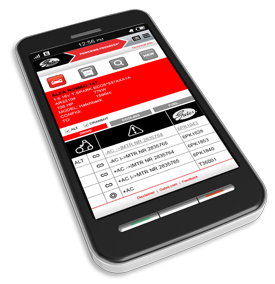 Gates’ online version of its application catalogues, www.gatesautocat.com, is now smartphone friendly. The mobile version of the catalogue allows mechanics and technicians to consult the up-to-date application data anywhere, anytime. The extensive online catalogue gives detailed application and product information for all car models. For each car model, the available Gates drive system products, heavy duty system products, cooling system products and fuel caps can be found. The new mobile site gives mechanics and technicians an alphabetical list of the products available, various size listings, and clear product images. Gates’ specialised application research team monitors the market very closely to keep the range up-to-date. So, whichever vehicle the installer has in front of him, he can always be sure to find a quality product that matches the original in the Gates range. To make it even easier, he mechanic or technician can now also access the mobile web catalogue via the QR-codes (Quick Response codes) displayed on the Gates packaging. By scanning the code, the installer is taken immediately to the relevant information for the specific product he is working with. Next to specific application data, the web catalogue also offers any related technical bulletins, belt routing info, product images, and possible kits. The functional design of the online catalogue allows visitors to quickly access all the necessary information for the Gates products available for any specific car type. Not only has the website been redesigned, Gates still has 15 different language versions at the client’s disposal.